The American Theatre Critics Association (ATCA) continues to address the issues surrounding Chicago Sun-Times critic Hedy Weiss and her controversial review of Steppenwolf Theatre’s production of “Pass Over” from Antoinette Nwandu. The play centers on a dangerous city street corner encumbered with gun violence and “simplistic, wholly generic characterization of a racist white cop,” according to Weiss. Her review led to an online petition (with 3,500 signatures) asking Chicago theaters to drop Weiss from all critics lists. ATCA is a prime example of examining deeper issues and updating Codes of Conduct in the world of arts and entertainment. In addition to theater, television continues to make advances for women and minorities. At this year’s Television Critics Association, NBC formally launched their “Female Forward Initiative,” increasing the number of female directors on the popular network’s list of programs slated for Fall. Many film critics associations, however, continue to have a disproportionate percentage of voices, including Rotten Tomatoes, composed of roughly 83 percent men and only 17 percent women. While Weiss’ controversial critique has opened the floodgates of discussion on theater criticism, film criticism has a long way to go. 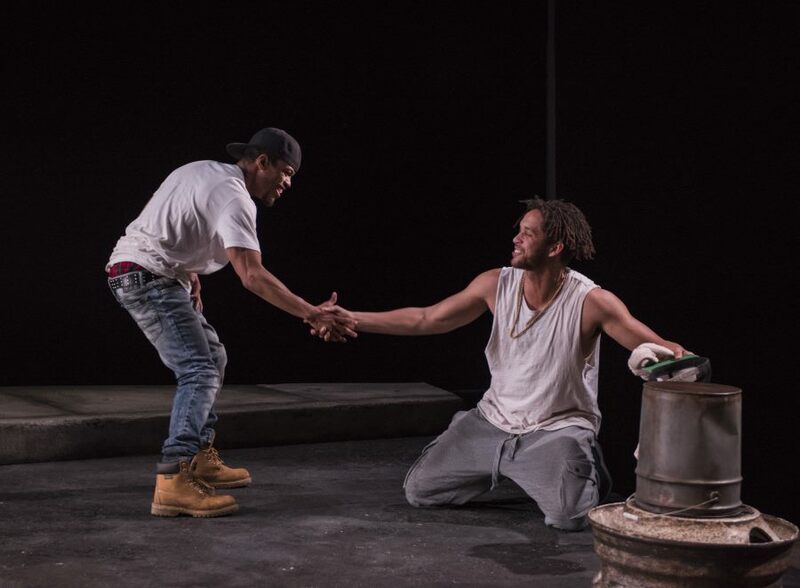 Jon Michael Hill and Julian Parker in “Pass Over,” by Antoinette Nwandu at Steppenwolf Theatre Company.